A Kiliholidays safari remains as the most popular safari in Tanzania. 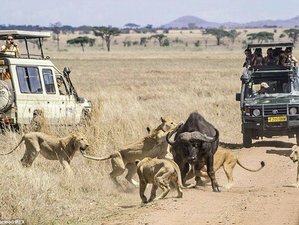 In this trip, you will travel in four-wheel-drive vehicles and visit the most exciting game parks in the country, including Lake Manyara, Serengeti National Park, Ngorongoro Crater, and Tarangire National Park. You have the opportunity to spot the Big Five and a huge variety of other species. Group size: The maximum number of participants for this safari is 15 persons. Children policy: The minimum age allowed to participate in this safari is 6 years old. Vaccines needed: Since some diseases such as yellow fever are commonly found in Africa, you will need to get immunized before you travel. Other than yellow fever, vaccinations that you would need include hepatitis A and B, and typhoid. During this safari, you will stay in various accommodations depending on the park you will visit. This will be your home on the first night of your safari. Ideally located in the heart of Arusha, the Africana Grand Hotel offers you a warm atmosphere and excellent service, combining charm and modernity. You will surely enjoy a pleasant stay at their spacious contemporary rooms with en-suite bathrooms. You will spend your third and fourth night here. A mobile tented camp located in Central Serengeti, it is strategically located to cover the vast Serengeti Plains. The camp offers comfortable accommodation and a unique opportunity to enjoy a real safari camp experience. The camp is only a two-hour scenic drive from Olduvai Gorge Museum and Grumeti River. A cozy mess tent is located in the center of the camp where meals are served. The campfire is ready every evening for appetizers and snacks before dinner. On your fifth night, you will stay at Ngorongoro Sopa Lodge. Facing the always magnificent sunsets to the west and located at the highest point on Ngorongoro crater’s entire rim, Ngorongoro Sopa Lodge stands well over a half kilometer above the crater floor and offers unparalleled views across this enormous caldera. Themed around traditional circular African houses with conical roofs, and decorated with examples of Africa’s rich tapestry of artistic traditions by way of rich woodcarvings and sculptures, the lodge harmonizes perfectly with its dramatic surroundings. The drama does not just stop with the great outdoors. It also flows through the split-level interiors of the main building which offer an unsurpassed generosity of space while somehow managing to combine an almost magically welcoming ambiance of both warmth and coziness. Flamingo Lodge will be your home on the sixth night of the safari. Perched at the edge of a natural bluff, Tarangire Safari Lodge is renowned for its panoramic views of the savannah and Tarangire River below, providing breathtaking scenery and game viewing right from its sweeping terrace and your doorstep. Its quintessential safari tents, with thatched roofs and large, mesh-screened windows, provide the perfect opportunity to connect with the sights and sounds of nature. Each tent has a comfortable veranda, ideal for bird and game viewing or reading your favorite book after a dusty safari. With a choice of twin, double, or triple accommodation, all tents are equipped with en-suite bathrooms with solar-heated showers, ample cupboard space for your gear, and a cultural touch of local textiles. You will enjoy all these on your last night. Upon arrival at Kilimanjaro International Airport (JRO), you will be transferred to the Africana Grand Hotel. The rest of the day is at your leisure. Bed and Breakfast. After a welcome and briefing at your hotel, you will travel to the Lake Manyara National Park. This small park is a paradise for serious and amateur bird-lovers as this small park is home to over 400 species of birds, including flamingos, pelicans, storks and cormorants. Many mammals, such as bush bucks, water bucks, wildebeests, zebras, baboons, monkeys, lions and leopards can be seen roaming the forest and the acacia-dotted plains of the park. You will have an unhindered view of the surroundings as the safari vehicle’s roof can open up to allow you the best angle for photography. After an extensive game drive in the park, you will leave the park in the afternoon. Tonight, you will spend the night under the stars as Twiga Safari lodge in the small town of Mto wa Mbu. Lunch and dinner will be provided. After breakfast, you will have a game drive in Lake Manyara National Park and return to the lodge in time for lunch. Leaving Lake Manyara behind, your journey continues northwest across the stunning hilly countryside of the highlands, which is filled with wheat and coffee plantations, and then into the Ngorongoro Conservation Area. From there, lies the vast plains of the Serengeti, where you will hopefully start spotting game well before you get into the park. Your home for the next two nights is Serengeti Kati Kati Tented Camp. Breakfast, lunch, and dinner will be provided. Today, you will enjoy morning and afternoon game drives in Serengeti National Park. Breakfast, lunch,and dinner will be provided. Overnight at the same camp. After breakfast, you will depart for the Ngorongoro Crater. View game across the vast Serengeti plains and stop en-route for your picnic lunch. You will then continue your journey toward Ngorongoro, where you will visit a Maasai village before heading to your lodge, Ngorongoro Farmhouse lodge. Breakfast, lunch, and dinner will be provided. A highlight awaits you this morning as you depart to explore what is commonly referred to as the world’s largest wildlife zoo. After breakfast, you will descend with a picnic lunch through the early morning mists and 2,000 feet into the crater. Ngorongoro Crater is the world’s largest intact volcanic caldera. Due to its size and diversity, the crater floor is comprised of several distinct areas,ranging from forest, swamps, lakes, and springs to open grassland and some sandy dunes. It is an awesome wildlife experience. Lunch is served near a small lake filled with hippos. You will then continue game viewing before returning to the crater’s rim. Overnight will be at Octagon Lodge. Breakfast, lunch, and dinner will be provided. Departing Ngorongoro Crater after breakfast, head southeast past Lake Manyara and Mto wa Mbu village. Through the highlands and the Karatu district, you will view the scenic wheat plains and coffee plantations before journeying down the spectacular escarpment where you will turn south onto the main Arusha-Dodoma road and into the park. From there to the lodge, you will enjoy a game drive en-route. After lunch and perhaps a swim at Twiga Safari Lodge, the remainder of the afternoon will be spent on a game drive. Breakfast, lunch, and dinner will be provided. You will depart after breakfast and head northeast to Arusha. The journey will pass through the Maasai Steppe filled with many picturesque African villages as well as maize, coffee, and banana plantations. Arrive back into Arusha around midday to connect with your onward arrangements. On the fifth day of the safari, you will visit a local Maasai village and immerse in their culture. This safari tour will take place in some of the best national parks in Tanzania, including Lake Manyara National Park, Serengeti National Park, Ngorongoro Crater, and Tarangire National Park. The Lake Manyara National Park, which encompasses an area of 335 square kilometers, of which 200 square kilometers is a lake, was proclaimed a game reserve in 1957 and registered three years later as a national park. The park is situated between the 600-meter-high escarpment of the Great Rift Valley and Lake Manyara and is 130 kilometers from Arusha. Thus, it can be visited on a day excursion from this center. At the southern end of the park are hot sulfur springs known as Majimoto. Further along the forest, the area opens up into woodlands, grassland, swamps, and beyond, the soda lake itself. Nestling at the base of the Great Rift Valley escarpment, the park is recognized for its incredible beauty. Wildlife at Lake Manyara is not restricted to birdlife only. Many game animals such as buffalo, elephant, giraffe, impala, hippo, and a great variety of smaller animals also inhabit the park. Lake Manyara is also renowned for its tree-climbing lions which spend most of the day spread out along the branches of acacia trees six to seven meters above the ground. The park contains the most pachyderms per kilometer square in Tanzania. As visitors enter the gate, they pass into the lush forest, home to troops of baboons and blue monkeys. Buffalo and hippo lurch in the adjacent Hippo Pool. The vegetation eventually merges into flat-topped acacia woodland where, in the heat of the day, entire prides of lion can be seen stretched on the branches of these trees, a habit prevalent to Manyara lions. Along with these amazing tree-climbing lions, there are the usual browsers and grazers as well as the curios-looking banded mongoose. Two-thirds of the park is dominated by the slightly alkaline lake, which is home to a huge variety of waterbirds. Tanzania’s oldest and most popular national park, also a world heritage site and recently proclaimed a seventh worldwide wonder, the Serengeti is famed for its annual migration, when some six million hooves pound the open plains, as more than 200,000 zebras and 300,000 Thomson’s gazelle join the wildebeest’s trek for fresh grazing. Yet even when the migration is quiet, the Serengeti offers arguably the most scintillating game-viewing in Africa, great herds of buffalo, smaller groups of elephant and giraffe, and thousands upon thousands of eland, topi, kongoni, impala, and Grant’s gazelle. But there is more to Serengeti than large mammals. Gaudy agama lizards and rock hyraxes scuffle around the surfaces of the park’s isolated granite koppies. A full 100 varieties of dung beetle have been recorded, as have 500 plus bird species, ranging from the outsized ostrich and bizarre secretary bird of the open grassland to the black eagles that soar effortlessly above the Lobo Hills. As enduring as the game viewing is the liberating sense of space that characterizes the Serengeti Plains, stretching across the sunburnt savannah to a shimmering golden horizon at the end of the earth. Yet after the rains, this golden expanse of grass is transformed into an endless green carpet flecked with wildflowers. And there are also wooded hills and towering termite mounds, rivers lined with fig trees and acacia woodland stained orange by dust. In nearly three million years ago, Ngorongoro towered alongside Mount Kilimanjaro as one of the highest peaks in Africa. Forged during the tumultuous birth of the Rift Valley, its volcanic top erupted at the time that ancient man first walked the plains. The Ngorongoro Conservation Area (NCA) covers some 8,300 square kilometers. It boasts the finest blend of landscapes, wildlife, people, and archaeological sites in Africa. It is also a pioneering experiment in multiple land use. The concept of multiple land use in conservation perspective is a deviation from a traditional approach of regarding conservation as complete absenteeism of human interference. Today, Ngorongoro’s caldera shelters the most beautiful wildlife haven on earth. The rich pasture and permanent water of the crater floor supports a resident population of some 20,000 to 25,000 large mammals. They are not confined by the crater walls and can leave freely. They stay because conditions are favorable. Since most of the crater floor is grassland, grazing animals predominate, including gnu, zebra, gazelles, buffalo, eland and kongoni (Coke’s hartebeest), and warthogs. The swamp and forest provide additional resources for hippos, some of Tanzania’s last remaining black rhinos, giant-tusked elephants, waterbucks, reedbucks and bushbucks, baboons, and vervets. The steep inner slopes provide a habitat for dikdiks and the rare mountain reedbuck. Towering euphorbias cling to the crater walls, and on the floor, fever tree and fig tree forests give shade to an awe-inspiring array of creatures. All these animals, in turn, support large predators such as lion and leopard and scavengers such as hyena and jackals. For the best viewing and photography, approach the animals slowly and quietly and stay on the official tracks. It is the vast number of baobabs that first capture the eye as you enter Tarangire National Park. The gently rolling countryside is dotted with these majestic trees, which seem to dwarf the animals that feed beneath them. The park owes its name to Tarangire River, which flows across the area. It is characterized by dense vegetation of acacia and mixed woodland. The area around Tarangire River, however, is dominated by huge baobab trees and old doum palm trees to a lesser prominence, as well as black cotton grass. Though it is not as famous as other parks in the north, Tarangire offers the same attractions as other parks in the north. Its unique aspect is the annual animal immigration that takes place during the dry season. While Serengeti’s animal migration has attained mundane fame, for many tourists, little is known of Tarangire annual migration. The difference with Serengeti, however, is that in Serengeti, animals migrate away from the park during the dry season (June to October). The opposite happens in Tarangire. Animals migrate from Maasai Steppe to the park during the dry season. They migrate to the park in search of water, which is provided by Tarangire River, and predators migrate along in search for preys. During this period, the park has the largest concentration of animals than in any park in the northern Tanzania. You will be provided three daily meals and mineral water throughout the safari. Please book your flight to arrive at Kilimanjaro International Airport (JRO) or Arusha Airport (ARK). Transfer from and to the airport is included. Kiliholidays Tours & Safaris will pick you up from the airport. Airport: Arusha Airport Airport transfer included: Arusha Airport No additional charges. You can request this in the next step. Kiliholidays Tours & Safaris is one of Tanzania's youngest and respected tour operators, offering extensive tours to various safari destinations.